August | 2007 | Stay out of trees! Upon arriving home from the Rabid Circus Animal Jamboree otherwise known as the “A” ride I did find a most curious package upon my doorstep. Todays Daily Iowan 80 Hours section wrapped with electrical tape around a cylindrical object. A tidy Sharpie script announced “Thanks Steve” in basic black so I did not call the police to have it investigated but ripped it open with glee to find a fine insulated travel mug inside! Not only is it a stainless steel body but it also has a screw top! Who left it here? Where did they get it? Why did they thank me, what did I ever do to them? How can I find out who left it? I will ponder these questions and more after watching The Life Aquatic with Cody. Its a date, yeah. Thanks to you, mystery cup giver! Our house was a bit moldy when we got back due to incredible rain and humidity whilst we were away. 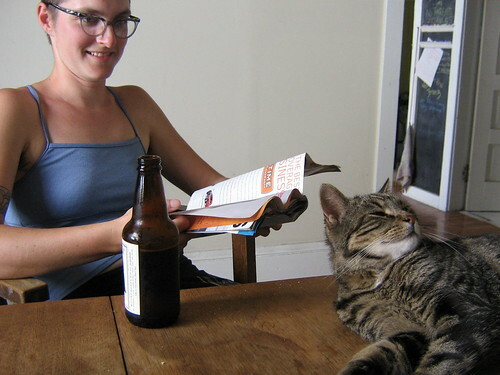 Kitties were both furry and breathing which we attribute to the wonderful care they recieved from The Adult. We are happy to be home, Iowa City is great! Cody jumped right into student teaching the day after we got back. Last weekend was not only the Portland Zine Symposium but also Bridge Pedal. Portland has lots of bridges and on this ride they shut them all down and let bikes roll with glorious abandon up em’ and down em’. 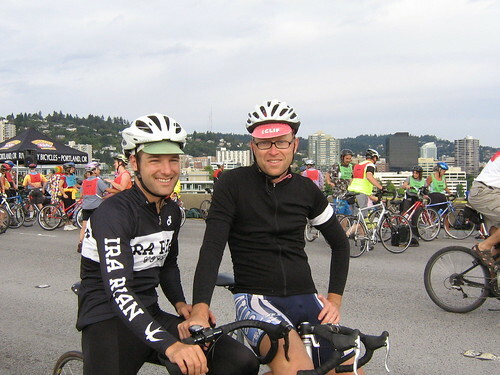 I really wanted to go experience Portland Bike Culture and ride over bridges, too. Ira assured me I was crazy and told me all about the riders who ride only once a year and swerve all over because they don’t know better and how the ride gets all bottle-necky and such. I still wanted to go as I am stubborn but I am also agreeable so I let Ira take me on a custom bridge pedal. Ira loves the custom you know. We encountered the route soon after leaving the house and so first climbed the Fremont Bridge, which is tall, and saw Mt Hood, which is taller. 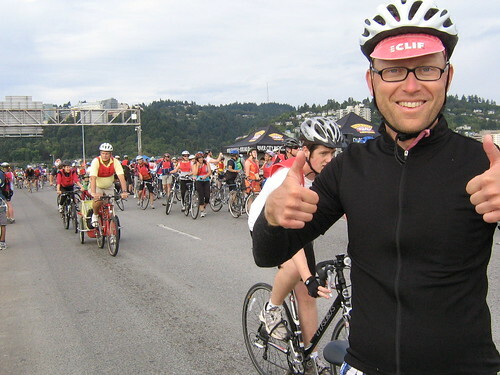 We then abandoned the ride and cut across downtown to ride another bridge when we came upon a bottleneck. It was crazy just as Ira had told me it would be. We turned around and went and found another bridge to ride over and got our pictures taken at the summit to prove we were there. There you have it folks, real live Porland Bike Culture participation! Why am I grabbing Ira’s stem? The website said 20,000 people rode. Wow-Wee! We are out of here tomorrow, but not until after I have had my appointment with the Ira previously mentioned to work out the details of my new Ira frame, exciting! See you in Iowa if you are there! Look at all those exclamation points, jeesh. Cody and Ira and I took our 3 day bike tour and it was A-Ok! Ira was a great tour guide, he planned a good route for us which included train rides, rides on quiet and narrow roads over picturesque Oregonian mountainsides, sweat, coffee, ocean views, flat tires, busted spokes, descents with and without RV’s trying to pass, a possible elk sighting, a written warning from the Tri-Met police for harboring an illegal tandem in the traveled way, one oncoming coast to coast bike tourist about to finish the journey, a nice night in a beachfront cabin, wine and cheese, saddle adjustments, really cold showers, logging trucks, oatmeal a plenty, fine conversation and company and one all out sprint versus a poop shooting cannon that was firing its rank payload with gusto all over a farm field as we happened by. To the photos then! Here we are riding the train Laverne & Shirley style. Cody and I rode a borrowed tandem. We had no prior tandem experience other than puttering around Iowa City on our single speed coaster brake Vista. This beast was a bit more complicated but it was sporting the always stylish and lightweight WALD front basket! This little photo here is of our first night campsite, it was beautiful! Never go camping without an Ira Extinguisher! 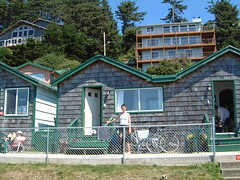 We had a marvelous ride to the ocean side community of Oceanside then, we stayed in a cabin that was right on the beach! 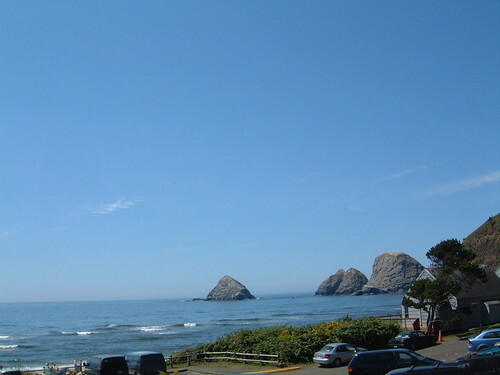 We (well, Cody and I) were so excited to see real live Goonies rocks. After a restful night in the Pacific Ocean’s warm embrace we set out on our longest day back to Portland in one shot. The chilly misty morning featured the aforementioned poop shooter that got our heart rates up but also contained a marvelous second breakfast at Alice’s Restaurant. 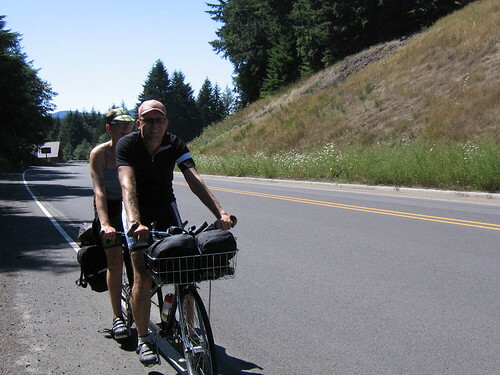 Before long we were climbing the coastal range and then descending it very fast on our loaded tandem. The weather did a switcheroo, too and I must say it was perfect for our entire trip. The last few miles of the trip were arduous as we were hassled by the Hi-Vis “Man” on the train and then the big city traffic on the roads but these trials ensured that we were happy to be back at the house. Finding three beers left in the fridge and getting to drink them in the company of a happy kitty iced the perfecto cupcake of a trip. 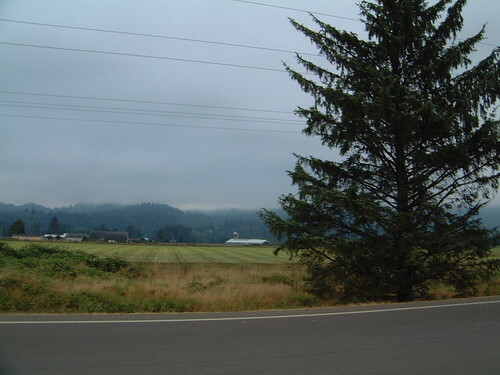 Check out Cody and Ira’s weblogs for additional perspective and photos if you like! So much going on, who has time to write about it. I can barely remember what I did yesterday but I will give it a shot. The Portland Zine Symposium was this weekend and Cody and I spent 2 full days at it. I am enjoying the winningest Trans-Iowa bike ever built while Ira is enjoying his new Rapha edition Ira Ryan which is neat-o like a handlebar or a stem even. I met Sacha White of Vanilla and enjoyed a coffee with he and Ira at Stumptown. He was very nice and it was a pleasure to get to talk with him. Cody and I rode up a big damn hill the other day to visit the Japanese Gardens which are lucky enough to have our old friend Mary caring for them. She is one of six master gardeners and as such does just about everything there including raking the zen gardens (3) and feeding the fish (60 of em, some of them are older than me!) and taking care of the “natural” portion of the garden. This is Mary in her garden. While we were touring the gardens we saw a frog in a Hosta! We also saw a real live honest to goodness hawk in one of the waterfalls. Mary was impressed and crept close to take pictures, I will share them later. It was cool! Ira is a DIY dude as you may have heard and this morning he showed us how to roast coffee on the stovetop. Step 1, roast it! Step 3, put it in a jar and pose for a picture while you are still really tired because you have not had any coffee yet as your piping hot mug awaits! 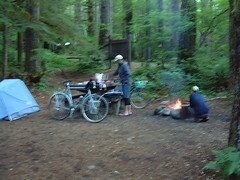 The trip has been great, tomorrow we will ride to the ocean (the left side one) on a borrowed tandem (fun!(?)) with Ira and maybe someone else but maybe not. Cody and I reserved a beachfront cabin in Oceanside so it promises to be a great ride with at least one restful evening. I will try and check in again before we head back to Iowa but who knows, we have so much to do! I leave you with the timeless image of a framebuilder hard at work in his underground bunker. Here I am, enjoying Portland. Did a 3 hour ride with Ira today after riding an hour each way to the glorious paint shop to pick up 2 of his new bikes that are ready to be built. We had coffee, too. This has been the way of things since our arrival. The train trip from Sacramento to here was poopY with a capital Why, you ask? Our midnight train was 3 hours late. It lost another 2 hours as it crept north. We were in coach. Coach is “gritty” and especially after 2 days in a sleeper living the first class lifestyle. We did get to see Mt Shasta. Bonus. Ira picked us up via cargobike at the train station. He brought a bike down on it and I rode that away and Cody rode in the cargo bin. It was awesome, we stopped for pizza and beer on the way. Good times. We rode Ira’s IRONCHUNK creation around the neighborhood, the Tom Cruiser! bmx style bike w/sidecar – sketchy! We have hit a few bike shops including City Cycle which has better parts bins than the Bike Library and (to Cody’s delight) real women employees! Ira’s house is filled with bicycles and bicycle lovers (both house mates are messengers) and is quite the fun place to hang out, it even has a funny bike! I gots ahold of me Ira Ryan jersey, too. Much more to report but it must wait until later. Chow! Cody and I are in Sacramento, CA. Just down the street from the governor’s office! It was a marvelous train ride out here, I recommend it. Quiet, fast (compared to walking or biking) and relaxing. We slept in beds, read books, ate fine AMTRAK eats and even had a beer. We had a good time and read 4 books total! The California Zephyr (1 hour late) ! The Scenery was wonderful, 2 days worth! The Lovely & Amazing Reno Trench! Our next train will take us north to Porland, we are going to be stuck in coach. The train is scheduled to depart at midnight but is already 2 hours late, will we survive?